296 Commonwealth is located on the south side of Commonwealth, between Gloucester and Hereford, with 294 Commonwealth to the east and 298 Commonwealth to the west. 296 Commonwealth was designed by architect Samuel D. Kelley and built in 1880-1881 by brothers John W. Shapleigh and Samuel M. Shapleigh, carpenters and building contractors, for speculative sale, one of three contiguous houses (294-296-298 Commonwealth). The land for 294-296-298 Commonwealth was purchased by the Shapleighs on June 18, 1880, from William D. Pickman and Jacob C. Rogers; Samuel Shapleigh purchased the lot for 294 Commonwealth, John Shapleigh purchased the lot for 296 Commonwealth, and the two brothers together purchased the lot for 298 Commonwealth. The lots were part of a tract of land originally purchased by Nathan Matthews on January 2, 1871, from David Sears, Jr., Frederick R. Sears, and Knyvet Sears. Click here for an index to the deeds for 296 Commonwealth. On August 6, 1881, 296 Commonwealth was purchased from John Shapleigh by Wallace Fullam Robinson. He and his wife, Jennie (Robinson) Robinson, made it their home. Their son, Harry Ezra Robinson, lived with them. They previously had lived at 30 Rutland Square. Wallace Robinson was a wholesale meat packer and later vice-president of the United Shoe Machinery Company. He was one of the organizers of the Chicago Stock Exchange. Jennie Robinson died in May of 1910. Wallace Robinson and Harry Robinson continued to live at 296 Commonwealth. Wallace Robinson died in February of 1920. Harry Robinson continued to live at 296 Commonwealth. In 1925, he married Katherine Cahill, his housekeeper. Katherine Robinson remarried in 1930 to Norman E. Chase, a musician. They lived at 296 Commonwealth during the 1931-1932, but moved thereafter. They also maintained a home in Concord, Massachusetts. On November 24, 1931, 296 Commonwealth was purchased from Katherine (Cahill) Robinson Chase by Thomas Goddard Frothingham, Gino Lorenzo (Lopez) Perera, and Albert Wallace Rice. Thomas Frothingham was a military historian and author, Gino Perera was a musician and painter, and Albert Rice was an architect. 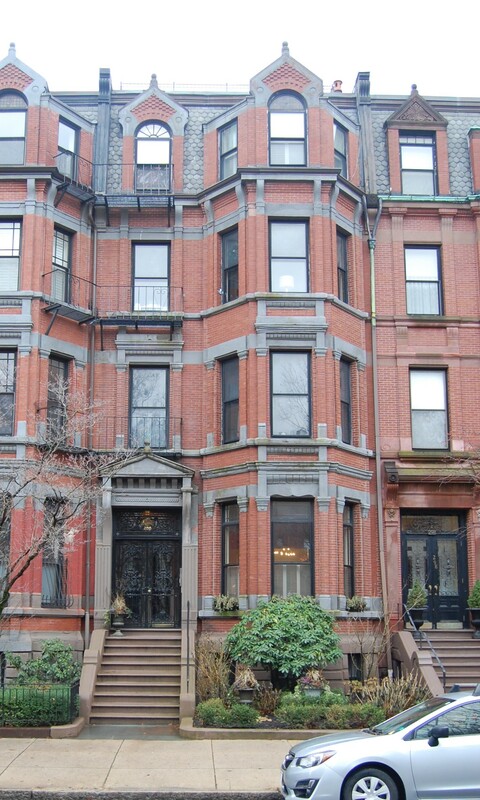 All three were officers of the Copley Society of Boston, formed to support the visual arts and the advancement of its member artists and appear to have purchased the property on the organization’s behalf. On March 2, 1932, 296 Commonwealth they transferred the property into the Copley Society’s name. On January 4, 1945, the Copley Society transferred 296 Commonwealth to the Franklin Savings Bank of the City of Boston for the value of the mortgage it held on the property. 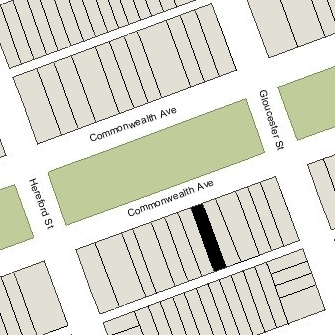 296 Commonwealth was shown as vacant in the 1945 City Directory. On January 17, 1945, 296 Commonwealth was acquired from the Franklin Savings Bank by Mrs. Edna Mae (Reynolds) Candage Lovejoy Walsh Grant. She was the former wife of Henry (Harry) Wells Candage, the widow of Everett John Lovejoy and Dr. William Martin Walsh, and the former wife of Wallace Edwin Grant. She lived at 164 Bay State Road and later would live at 470 Beacon. That same month, she applied for (and subsequently received) permission to convert 296 Commonwealth from a single-family dwelling into five apartments. On June 27, 1947, 296 Commonwealth was acquired from Edna Grant by Joseph Wellington Strain and his wife, Katie Clark (Greenlaw) Strain. They lived in an apartment at 308 Commonwealth. On November 30, 1953, 296 Commonwealth was acquired from the Strains by the National Realty Company (Charles Talanian, president, and Thomas J. Diab, treasurer). On December 24, 1953, 296 Commonwealth was purchased from the National Realty Company by Henry Samuel Benoit Tremblay and his wife, Eileen M. (Murray) Tremblay. They lived in one of the apartments. Eileen Tremblay died in August of 1973, and Henry Tremblay moved soon thereafter. The property changed hands and on September 28, 1979, was purchased by The 296 Partnership (Clifford S. Killips, Nicolas A. Kensington, and Donald J. Steiner, general partners). In December of 1979, the partnership applied for (and subsequently received) permission to renovate the five existing apartments. On October 3, 1980, the partnership converted the property into five condominium units, the Oliver Wendell Holmes Condominium. 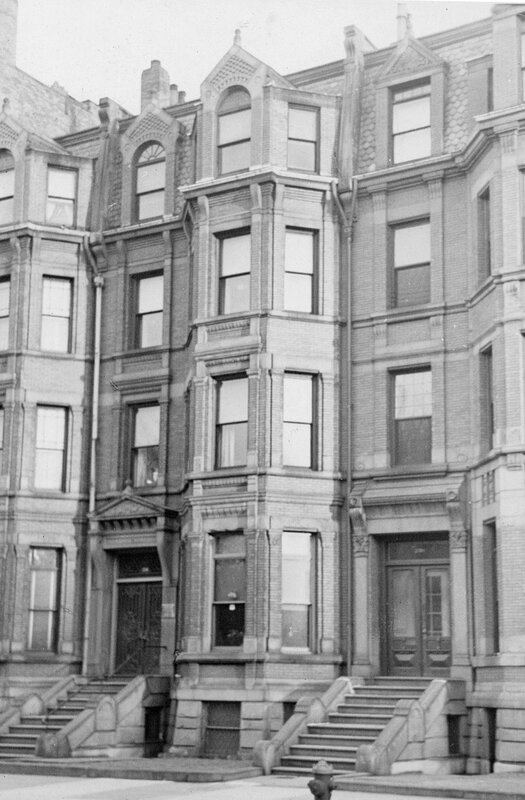 In September of 1985, the Oliver Wendell Holmes Condominium Association applied for (and subsequently received) permission to construct a two-story addition at the rear.